For someone who believes, as my colleague and coach Mary Jo Asmus does, that “it’s all about the relationships,” then this is a major cause of supervisors and managers derailing in their careers. Most successful organizations have effectively broken down the walls or silos that once existed among their internal units or teams. People move so frequently in larger organizations, and responsibilities change so quickly, that you can’t be successful unless you build effective relationships. Your potential for success in higher levels of management depends on your ability to build partnerships and positive relationships with your boss, your employees, and your peers. In the end, being a successful manager and leader is indeed all about relationships. Think about your own key relationships. Are they all in the shape you’d like them to be? Could one or two relationships benefit from greater effort on your part going forward? 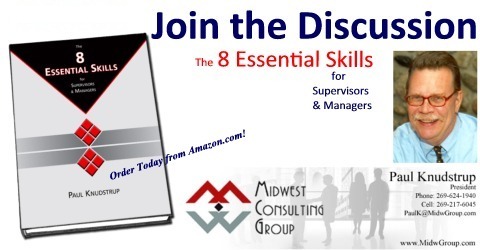 In The 8 Essential Skills for Supervisors & Managers, you will find some excellent suggestions and tips for improving those key relationships. Ken was a middle manager in a manufacturing company. He had a talent for communication – for vividly passing on to others the company’s and unit’s vision and strategy. Like most managers at his level he also had budget responsibilities, for which he had little talent or interest. Many companies would send Ken through a series of budget or financial training programs, trying to improve his skills. Over time he might improve his skills to the point of basic competence, but the financial end of the unit will never be a strong suit. Instead, Ken’s company recognized his strengths. He went through a basic training program in the company’s budget process and then delegated most of this responsibility to a trusted team member who understood the process and enjoyed working with financial data. This freed Ken to concentrate on doing what he liked and what he did best. He continues to work hard to improve his communication skills, keeps up to speed about industry developments, and is seen as a high-potential candidate for movement into corporate planning and executive management. Thanks, in part, to his company’s support, Ken was able to focus on one of his talents and turn it into a significant strength. By building on his talents and managing around his weakness in budgeting, he is in line for the executive suite and the company is growing a highly valuable employee. We live and operate in a rapidly changing world. Stepping into supervision for the first time is a combination of several emotions; excitement, uncertainty, a bit of fear. This means we must constantly take on new tasks and projects and operate outside of our comfort zone in an ever-evolving, dynamic, ambiguous environment. Rapid lifelong learning will always be necessary. You need to accept that you’ll never feel you’re really up to speed. So it’s important for you to understand what your boss and others think that phrase means, and then give it your best shot. What are the key expectations for you and your job?